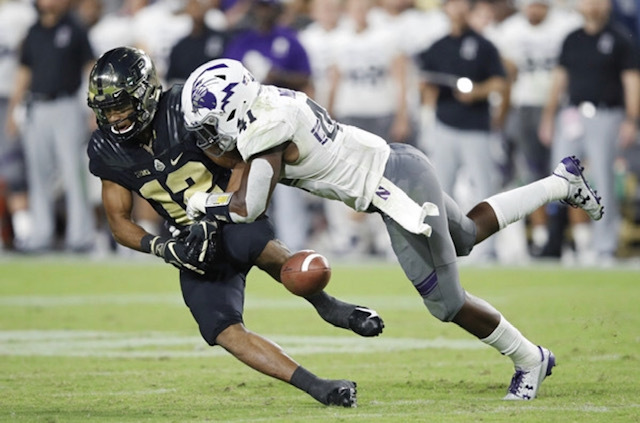 Growing up in Arlington, TX, Northwestern University star safety Jared McGee was ingratiated into football culture at an early age. Like many others in the Lone Star state, McGee had other viable options at his disposal; but none of them seemed to measure up. He was smitten with league dreams, and he pursued them aggressively. It was his aggression and physical playing style that got him recognition, but also led to numerous concussions that left him wondering whether or not he would continue to play the game. That particular concussion happened against South Grand Prairie High School during his sophomore season, and that moment would permanently be marked as a turning point for McGee’s career. A fork in the road, McGee could’ve quit at that point, but he didn’t. Instead, that moment acted as his point of no return, and his level of play skyrocketed during his junior and senior year seasons as he totaled over 120 tackles. McGee had no idea that Northwestern would recruit him. When he received the call toward the end of his senior year, he knew that God had answered his prayers. From that point on, he knew his life would permanently change. Fast forward to January 2018 after his junior season with the Wildcats, McGee underwent a successful hip surgery at Northwestern Memorial Hospital. The next four to six months of his recovery process would be vital. In order to get playing time, he would have to be at training camps in order to build relationships with some of the new position coaches on staff. As the oldest safety in the defensive back room, his expectation was that if he remained healthy, he would get every opportunity to start for the Wildcats in 2018. Upon his return to the team for August training camp, things didn’t go as planned. The defensive backs coach, who he’d spent years playing for, retired. Matt ‘Mac’ MacPherson, the team’s running back coach for the last 12 seasons, would take his place. It only took McGee a few weeks to realize that his relationship with his new coach would inevitably sour. Despite relationship struggles with his position coach throughout his senior season, McGee started 10 out of 11 games: tallying 51 tackles, four tackles for loss, four pass breakups, an interception, a forced fumble, and a fumble recovery. In addition to having a solid pro-day, his performance this season was enough to impress a number of NFL teams. The Chicago Bears and the Green Bay Packers have scheduled McGee in for visits, where he’ll do more position drills with team personnel before the NFL draft at the end of April.